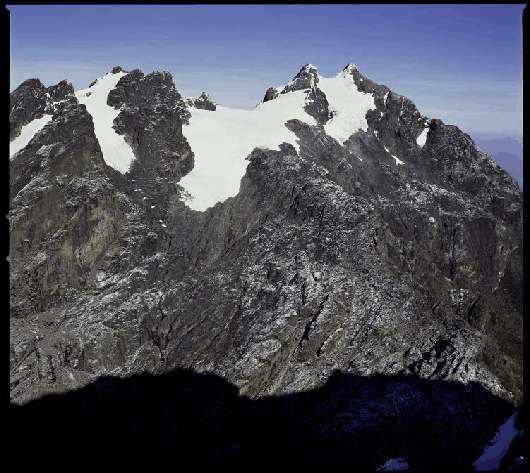 Rwenzori mountain of the moon. (please consider our optional gorilla safari or mountain extension) . We are excited to announce a new trip to Africa's 3rd, 4th, and 5th highest mountains, located in a gorgeous national park, rarely visited. There is stunning trekking and optional mountaineering on these mountains which are not often climbed. The range is about 120 km (75 mi) long and 65 km (40 mi) wide. It consists of six massifs separated by deep gorges: Mount Stanley (5,109 metres/16,750 feet), Mount Speke (4,890 metres/16,000 feet), Mount Baker (4,843 metres/15,900 feet), Mount Emin (4,798 metres/15,700 feet), Mount Gessi (4,715 metres/15,500 feet) and Mount Luigi di Savoia (4,627 metres/15,200 feet). Mount Stanley is the largest and has several subsidiary summits, with Margherita Peak being the highest point. The rock is metamorphic, and the mountains are believed to have been tilted and squeezed upwards by plate movement. They are in an extremely humid area, and frequently enveloped in clouds. 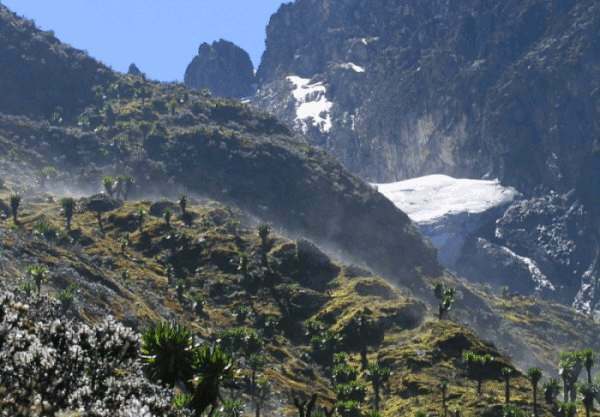 The Ruwenzori are known for their vegetation, ranging from tropical rainforest through alpine meadows to snow; and for their animal population, including forest elephants, several primate species and many endemic birds. One zone is known for its six metre/20 foot high heather covered in moss, and another for its giant lobelia. 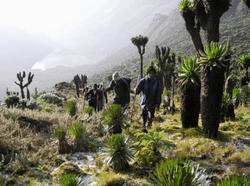 Most of the range is now a World Heritage Site and is covered jointly by The Rwenzori Mountains National Park in Uganda and the Parc National des Virunga in Congo. When you see the high level of service we provide, you may agree that the cost is affordable, inexpensive, even "cheap". Please "click" one of the links on the column on the upper right of your screen under "Rwenzori" to learn more about our expedition. Mountain -Extension (4 days): Some of us will stay 4 more days on the mountain for a better chance of climbing the three highest peaks and possibly exploring some new routes. Extra price: $750. allowed in the park every day, so as not to distract the gorillas (NP fees only are $750) and this trip is only possible on advanced booking. 1) Join our Mt.Kenya-Kilimanjaro mountain climbs previous to this trip. 2) Take a few days after the trip to enjoy the beaches of Kenya or Tanzania. 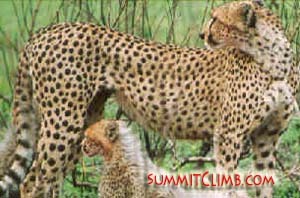 It is although possible to join the Mt.Kenya climb (9days) or the Kilimanjaro hike (7days). Please request our itinerary. Please click one of the links below to view that section of our Rwenzori daily itinerary or scroll down. Please also visit our Rwenzori route description for more about what to expect on the drive from Kathmandu, during the climb itself, etcetera. Please click here to view extension options and combinations of further adventures for your trip. allowed in the park every day, so as not to distract the gorillas (NP fees only are $500+ for Feb 08) and this trip is only possible on advanced booking. Double sharing: $1980, £1000, €1450. Please click one of the links below to view that section the route on Rwenzori, or scroll down. 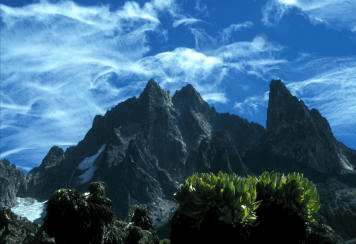 The Rwenzori Mountains lie along the western border of Uganda and rise to a height of 5,100 metres. They comprise the legendary "Mountains of the Moon", a World Heritage Site. These incomparable, beautiful, mist-shrouded peaks provide a unique backdrop to one of the most magnificent national parks. In the centre of the range, which boasts Africa's third highest mountain, some of the peaks carry permanent snow and glaciers, while the lower slopes are covered with dense forest. There are excellent walking routes, including the Bujuku circuit, which provide wonderful and unique scenery. 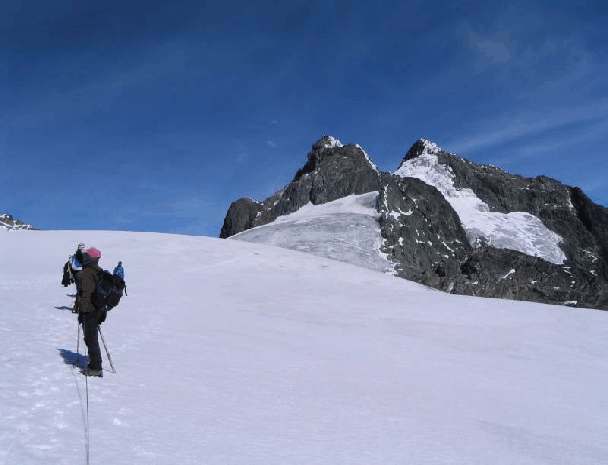 For those who want to attempt to climb, Mount Stanley (5,109 metres/16,750 feet), Mount Speke (4,890 metres/16,000 feet), and Mount Baker (4,843 metres/15,900 feet), have been compared to the Alps. To reach the Park Headquarters at Nyakalegija we travel past Mubende town to Fort Portal in Western Uganda. 5-10kms outside Kasese on the Kasese-Fort Portal Road, we will follow the signpost for the National Park. From the turn-off to the Park HQ is approximately 15 kms, traveling through villages. Overnight camping at the Park Headquarters. The trail passes along the western bank of the Mubuku River, passing through villages, leading up to the Park entrance. A 45-minutes walk gets us to the Park Entrance, where the trail slopes down towards the river, passing through lowland equatorial forest. Reaching the river, the path bears left away from the river, through more forest until one comes to a small bridge. Crossing the bridge, one starts climbing a moderately steep ridge. Elephants inhabit this area, and evidence of their presence (improbably large mounds of dung, huge passageways in the bush) will be seen. A word of caution: The elephants in this area are not very friendly, thanks to poaching activities during years past but our guide and ranger are trained to detect elephant presence quickly and react to ensure our safety! Elephant territory ends at Mahoma bridge, some 2hrs into the journey and a good resting place. We pass through more forest (where, if you are lucky you may see monkeys and chimpanzee), then through a field of ferns. As you gain more altitude, you will notice hanging moss growing on tree branches, and subtle changes in the forest vegetation, as trees become more spindly, and undergrowth thins. After about 4-5 hrs we should arrive at Nyabitaba Hut. We have 6 full days for exploring the mountains of the moon. We are in the middle of a fascinating mountain range with many hiking and climbing options around. Our base will be Bajuku Camp and 3hrs apart Elena Camp. Bujuku Camp - Situated on a slope at the northeastern tip of Lake Bujuku, Bujuku Camp(3930m, 0° 22.98' N 29° 53.19' E) has perhaps the poorest facilities at present. Consisting of a single-room tin hut (there is another for the guide and porters), this camp can be quite cold. The camp offers a breath-taking view of Lake Bujuku and the surrounding peaks. On a clear day, Scott Elliot Pass, the Stanley Plateau and Mt. Baker can be seen clearly. This camp also offers opportunities to spot the elusive duika antelope. The camp is a staging post for the trip to Elena Hut (and hence to Margherita) or to Mt. Speke. Trekkers to Mt. Speke will head out of this camp to attempt the peak. After packing up the camps, we will descend back the way we came to Kampala. In Kampala, you can have a day to relax, celebrate, tour the city, write postcards, and do a bit more shopping, before heading home. We hope you had a safe, enjoyable, and successful adventure. Thanks for joining in! Extra price (1 day with the gorillas): $950, £450, €700, although longer visits are possible if you wish to pay more for your stay. Please request early if you wish to prolong your trip to Africa with this unique and exciting adventure. Double sharing: $1240, £600, €900 (Min 3 people, without transfer from Kampala to Safari and back). Leadership: Felix , a proficient technical climber, a graduated mathematician and financial analyst, who lives in Zürich, Switzerland, and Berlin, Germany, is a full-time climber living of slide shows, guiding and leading expeditions. He has lived in Nairobi, Kenya, in 2002-2003 and since is our Africa expedition organizer, has successfully lead 6 Kilimanjaro and 10 Mount Kenya ascents and organized even more. He is fluent in Swahili, and has been involved in training the Kenyan Wildlife Service (KWS) mountain rescue team on Mount Kenya since 2004. Felix was the co-leader of our 2002 Kangchenjunga expedition and Everest-Tibet 2004. He is a very well organised person, and a strong climber, with good ideas, always eager to help others. He has made solo winter ascents of major North Face Routes in the Alps. Felix met SummitClimb, when he made an impressive no-rope ascent and descent of Ama Dablam with a German-Japanese expedition in 2001, then became a leader in training on Kangchenjunga and improved his leadership skills on Everest-Tibet 2004. Felix has his own website you might enjoy visiting: www.BergBote.de . Please be sure to return here when you are done. Thanks. Organizer: Your expedition is organized by our British, European, and American, office personnel working on-the-ground together as well as in your home-country. For example, one of our lead organizers is the very experienced Dan Mazur, trekking in Tibet since 1986 and climber-leader-organizer of Everest, K2, and 12 "eight-thousand-metre-peaks". He is a relaxed, friendly and well organized person, and a highly-skilled professional with 25 years experience in helping people explore the mountains, with the highest attention to detail, comfort, and safety. Porters: Our full service expedition supplies one personal porter per person during the expedition, so you don't have to carry a heavy ruck sack. Our goal is to work together as a team so that all members reach the top safely. We do not expect you to be expert (although some members are) but, nor are we a climbing school (although we do conduct one or two days of training at the beginning of each expedition, please see below). If you need fundamental technical training, and snow and ice experience, we urge you to participate in our Glacier School held each June and September. Members need to have experience in being part of a team, working toward a common goal, and be ready to work with the group and be a good "team-player". Our leaders are there to ensure (for our full-service members) you make it up to the summit and back down safely. However, this is not a guided expedition, and team members are expected to be able to care for themselves in a winter-camping and climbing environment. Obviously when climbing the highest peaks in Africa, there are hazards present, and members must have experience in roped rock and ice climbing techniques (to protect from falling down the mountain or into crevasses), and have winter-condition climbing experience in the greater ranges of the world, including placing and retrieving anchors, belaying, abseiling, glacier rescue and avalanche awareness. It is also required that all members will have knowledge of altitude sickness, frostbite, and the recognition of their symptoms, prevention, and treatment. When traveling above basecamp, all members must climb with another team member at all times. Upon arrival in Kampala and in the base camp, ALL full-service and basic-climb members are requested to participate in one to two days of orientation to how the trip will be operated. There will be plenty of time for discussion, question answering, and for equipment review. Training will be conducted in basecamp in the areas of climbing techniques, glacier travel, rope fixing, ascending, descending, safety techniques, rappels (abseils), belaying, medical equipment and procedures, communications equipment, camping techniques and high-altitude cooking. For the expert and beginner alike, it is important to review these techniques in order to enhance skills, ensure safety-awareness, and work together as a team. We hope that you will arrive for your Rwenzori Expedition in good health, both mentally and physically prepared, so we can work together as a team and have a successful expedition. On the mountain we supply plenty of food for you to cook 3 hot meals each day. This food will consist of soup, local cheese & sausage, biscuits, dried noodles, potatoes, rice, porridge, butter, dried and tinned vegetables, fruit, meats, and fish, tea with milk and sugar, powdered juice drink, and drinking chocolate. Our porters will be carrying this food to the higher camps. Lots of patience. Please relax, this is AFRICA !! We are friendly and highly experienced expedition leaders, climbers, trekkers and organizers, with a 17+ year track record of building high-quality, safe, friendly and fun climbing & trekking teams and successfully placing our team members on the summit, helping them achieve their goals, and getting home safely. Our leaders are not licensed guides, but some of the most qualified mountain specialists available. We are there to assist the entire group. This is a team effort. Our leaders and porters are there to help all members safely and successfully climb within their abilities; including an equal chance at the summit for everyone in the team. We send out a newsletter with all of the logistics for your arrival in Uganda approximately one month prior to the expedition. At this point, we usually share your email address with the other team members, so you may meet one another. We accept credit card, cheque, electronic bank transfer, cash, traveler's cheque, etcetera. You can post us cheques, pay in cash on arrival (initial payment required), send a bank wire, etcetera. If you wish to make a bank to bank transfer, we are glad to email you our bank details. We do accept credit card payments via www.Paypal.com . Its easy and safe to use Paypal throughout the world. About 25 percent of our members now pay with their credit card through Paypal. Our email address for Paypal is info@summitclimb.com . If you are considering using Paypal, and have never used it before, please sign-up early, as it takes a little more time, and your Paypal account may be subject to a monthly limit. Please click here to view our Rwenzori leadership page for more about our leader, organizer, and staff. Your expedition is organized by our British, European, and American, office personnel working on-the-ground together as well as in your home-country. For example, one of our lead organizers is the very experienced Dan Mazur, trekking around the world since 1986 and climber-leader-organizer of Everest, K2, and 12 "eight-thousand-metre-peaks". He is a relaxed, friendly and well organized person, and a highly-skilled professional with 25 years experience in helping people explore the mountains, with the highest attention to detail, comfort, and safety. For more about organizers, leaders, porters, and staff, please "click" here . If you are already a professional mountain guide, we are glad to offer you a 15% discount. Thank you for joining our team. 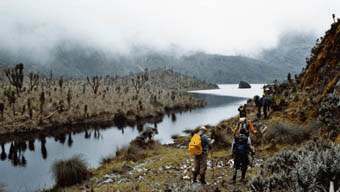 All of our full-service expeditions include porters for the group. We hire high altitude porters in a support capacity, and have very experienced, friendly, strong, helpful, and loyal people on our staff. During our expedition they will be carrying group equipment such as tents, rope, food, and gas. They are also there to assist in any rescues, so the other team members do not have to give up their summit attempt to rescue a sick member. Included in the full service price is one personal porter per person. Please do. Clothing and equipment gifts are highly appreciated. Also, children and wives and sisters and mothers and fathers and grandmothers and grandfathers need clothing and shoes too. Please remember that our porters and their families come in all shapes and sizes, from children to adults. Items that are very small or very large can be traded for items that fit. There are men and women, and they may be tall, short, extra-large, large, medium or small. The clothing and equipment you bring will be collected from you at the end of each expedition, then stock-piled by the lead staff and handed out to the porters at the beginning of each expedition. In this way, we can ensure that they will actually use it during the expedition and not sell it immediately. Quite often, during our lecture tours, we organize meets of our team-members. Please enquire as to the possibility of this in your area. Also, in our GLACIER SCHOOLS past, present, future, and prospective members are able to meet and climb together. Additionally, we encourage you to contact members who have been with us before and will be going with us again. Press the login/join us button on the lower left side of our home page to view past members. Approximately one month prior to the expedition we send out a newsletter with all of the logistics for your arrival in Africa. At this point, we usually share your email address with the other team members, so you may meet one another. 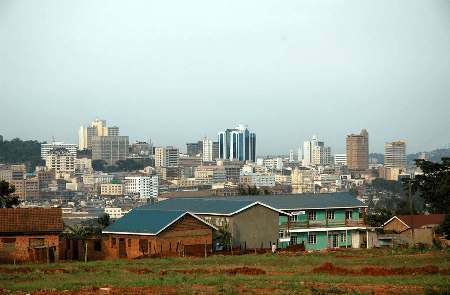 Most members prefer a single room while in Kampala. Our trek-tents and high-altitude tents are based on sharing. 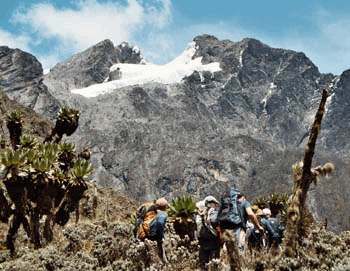 On the Rwenzori range, it is common to have groups of as many as 5 people ascend and descend together. However, team members are individually clipped to the fixed line. Each night, the groups will camp in an established campsite where there are multiple expedition tents. Throughout the climbing days and camping nights, our leaders and porters will be climbing and camping together with you to help set up tents and make sure you are staying healthy and safe and that things are going well. Our prices reflect our honesty, integrity, efficiency, and emphasis on providing a safe, high quality expedition for a fair price, as our company was founded 17 years ago by climbers for climbers, and we still have some of the original founders with us and strive to maintain these priorities. In addition, we have very long experience and deep connections with the mountaineering authorities in Africa, Nepal, and Tibet, and we are fortunate to receive favourable prices and better treatment. Even though our prices are less, our approach reflects the best possible value for money and emphasizes effective team building within our own expedition, as well as good relations with everyone on the mountain. We are dedicated to a philosophy of encouraging mountaineering by keeping costs to a minimum and welcome team members who are willing to share in achieving our objectives. All of our European, British, or US staff and leaders began their climbing careers as paying team members. Thus, we never charge more for a trip than we would be willing to pay ourselves. We have excellent relations with the government authorities who regulate the world of mountain climbing permits, liaison officers, drivers, etcetera. This is neither a luxury nor a 5-star expedition. Our equipment and methods are basic, simple, and proven over more than 50 Himalayan expeditions. We re-use our equipment and re-hire our staff over many expeditions. Our food is well prepared, abundant, and nutritious, but we do not use expensive imported foods. We neither print nor post expensive brochures. Yes, upon arrival in Kampala, all members are required to participate in a day of training and orientation (unless you have made special arrangements). Upon reaching basecamp, ALL members are again required to participate in one to two days of training (unless you have made special arrangements) in the areas of climbing techniques, glacier travel, rope fixing, ascending, descending, safety techniques, rappels (abseils), belaying, medical equipment and procedures, communications equipment, camping techniques and high-altitude cooking. For the expert and beginner alike, it is important to review these techniques in order to enhance skills, ensure safety-awareness, and learn to work together as a team. Please make sure you have studied the standard books, such as "Mountaineering, Freedom of the Hills", and are comfortable and familiar with the necessary climbing techniques, before joining our team. Thank you for being a well-prepared and safe team member! Our expedition includes transport of all of your equipment from Kampala to your destination, and returned to Kampala. While climbing on the trek, we DO NOT ask our full-service members to carry heavy group equipment (although it is an option if you really want to), such as tents, rope, fuel, food, etcetera. We employ high-altitude porters to carry group equipment and supplies. Rope is generally fixed from just above camp all the way to the summit where needed. For more information regarding the Rwenzori route, please "click here" . Kampala has no shortage of banks and forex bureaux, but the exchange rates vary greatly between them. Generally the forex bureaux offer better rates than the banks, but there are still significant differences between the bureaux. 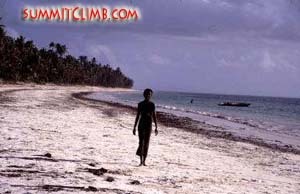 You will also find that you are offered better rates to change cash than you get for traveler's cheques. If you take cash make it US Dollars, GB Pounds and Euros to avoid complications. One of the best places to exchange cash and traveler's' cheques is the Metropolitan Forex Bureau where exchange rates were MUCH better than at the main banks, including Barclays. Metropolitan Forex Bureau can be found at Metropole House, 8 - 10 Entebbe Road. If you want to use a credit card to draw cash, the only place you can do so is Barclays in Kampala. You can pay with a credit card in some larger hotels and restaurants, but only in Kampala and Entebbe. Don't bother searching for ATM (Cash Machines) because unless you are inside Barclays Bank you almost certainly will not find one. Those members flying from North America are currently allowed 2 checked bags weighing 70 pounds/32 kilos each, plus one small carry-on weighing 30 pounds/13 kilos, for a total allowance of 170 pounds, or 77 kilograms. Baggage allowances change frequently. Before departure, you must ring your airline to verify the exact amount. We do not provide cold “snack” food such as chocolate or "energy-bars". We ask that you bring or buy your own "snack" or daily cold energy food, 2-5 kilos /4-10 pounds is a good amount. Please bring these from home, as the prices in Africa can be outrageous from what you may be used to paying for certain items. There is a difference of opinion, however, if you have not been to high altitude often, we suggest you consider trying Diamox. You may wish to start with one half of a tablet in Kampala to see how you react to the medication and if you have any side effects. During the approach walk to basecamp, as well as once we are on the mountain, we suggest you consider taking one to two tablets per day, depending upon your body weight, rate of ascent, and your reaction to the medication. Our members take great photos and we might ask your permission to use them in news stories on our news website. Of course you will be credited as the photographer. Any small and light camera will be fine. Many people use digital cameras now, and download their photos on our laptop in basecamp (our laptop works at high altitude, while yours might not, so check carefully before bringing your own laptop). If you are planning to download your photos, then you have to bring your own cable and your own software, if available. Digital cameras also have the advantage of being able to take small video clips. We love seeing your video clips on our site and they really add to the excitement of telling the story of your climb. There are some good digital cameras that will work well in the $200, £100, or €135 range. Be sure you always keep your camera in a plastic bag in the inside pocket of your jacket and you will have to sleep with it at night. You never want it to become cold or be exposed to wind, snow, dust, moisture or rain. There are new digital video cameras that are small and light and work well. Many members bring them and I have seen some very good quality movies made by the members. Some members have even edited their own feature length films from video they took with one of these good-quality small 'handi-cams'. With any camera, make sure you have your battery/charging system well-thought-out before you leave home, as options to figure this out in the mountains will be limited. Flights from UK or Europe to Entebbe (Kampala) currently ranges in cost. Flights from North America to Entebbe (Kampala) currently range in cost. All members must be present on the first day of our scheduled itinerary in Kampala unless you have made special arrangements. We need your passports on that day so that we can obtain the permit for you to go to the mountains, and do quite a bit of intensive orientation and training before setting off for the mountains, in the next day or two. After completing our orientation session and receiving our permits, we plan to depart Kampala the morning after the orientation, although the schedule may differ by one day. Our leaders are highly trained and extremely experienced in diagnosing and treating illness and injury in the mountains, and are well equipped with extensive medical kits. Hopefully, a doctor or medical professional will be present. We encourage doctors and medical professionals who climb and trek to join our teams, in return for a 10 % discount. Out of our last nine expeditions, six had a doctor, and two had more than one doctor. However, please remember that these people are here to get away from their normal hospital routine, and have come to climb and trek, and they are not here to operate an "expedition health clinic". Thank you. In case of emergency, God forbid, our leader and porters would help apply first aid, provide medicines and assistance with our medical oxygen, and "Gamow-Bag", then we would transport you to basecamp where an evacuation would take place. Only in extremely rare cases do such things happen, but, lets be honest, risks are present when climbing on any mountain. However, optimists will tell you that your chances of being involved in an auto-accident on the way to or from the airport might be greater than during the actual climb itself. BE SURE TO PURCHASE GOOD QUALITY CLIMBING AND TRAVEL INSURANCE. On this expedition we are staying in a local basic hotel inKampala. Hotels will be booked as double rooms and are based on sharing. If you wish to book a single room at your expense, please let us know in advance. We will book your hotel in advance. One of our staff will be able to take you to your hotel upon arrival. In Kampala, for a few days only, at the beginning and the end of the trip, you pay for your own meals . There are a wide variety of tasty restaurants in Kampal serving continental and local food. Prices are comparable to what you would pay at home, depending on how much alcohol you wish to drink with each meal. We do not encourage our members to drink too much. For example, maybe 50+ US dollars, 25+ pounds, 40+ euros, a day should be enough for all of your meals. Please review how much cash to bring for the expedition. Thank you. We bring one 2-way-radio for each camp, and a satellite telephone for international voice telephone calls. In Uganda, electricity comes from the mains in your hotel at 240 volts with a British style three-round-pin plug. Please be sure to read the back of your appliance or charger to make sure it does the voltage conversion automatically. There are a wide variety of travel adapters available for your appliances that convert voltage and have changeable pin options. What questions do you have? Please ask as many questions as possible. This helps us to have a proper conversation so we can better understand one-another's expectations, so you will have a very safe, enjoyable, and successful expedition. Thank you. Before completing the application forms, please be sure to carefully study the Rwenzori "Questions" website for information regarding flights, payment, team members, application forms, insurance, etcetera: Rwenzori Frequently Asked Questions.